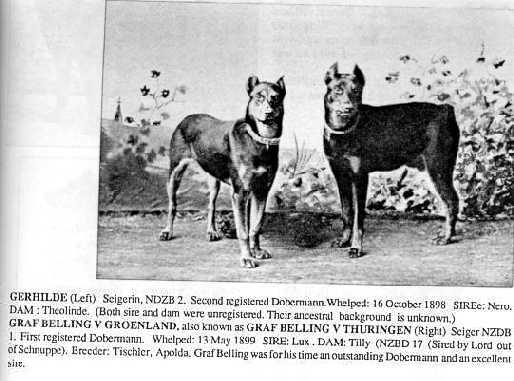 This was the first Dobermann to be registered in the National Dobermann Pinscher Stud Book. We find this black male not only under the name Graf Belling von Grönland but also under the name Graf Belling von Thüringen. 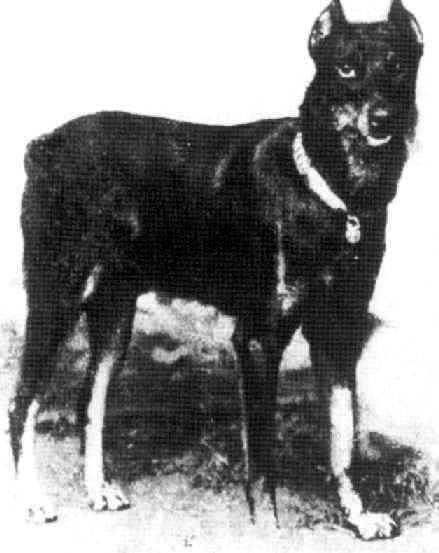 He was one of the so called five-star litter of Goswin Tischler, one of the first Dobermann Pischer breeders. According to Mr Grünig the progress of our breed would have been much slower without this litter. Belling's brother and sisters were called Greif, Tilly II, Krone and Lottchen. It is interesting to note that the parents of Tilly I were unregistered and had names like Lord and Schnuppine, names which were very common in those days. The parents of Lux were very closely related to the parents of Tilly I. It is even possible that the dam of Tilly I was also the dam of Lux's sire, a dog called Nero. Such strong in-breeding appears in the early generations of most breeds, so I think it is very likely. Graf Belling himself was, in his day, an excellent dobermann. He was short coupled with a well shaped head, but his coat was too long whit grey undercoat and his markings were too light. Graf Belling was not only a first class breeding dog but also an outstanding dog. He won 52 first prizes and became a German Siege. These great dogs at the beginning of the breed were often sold and resold. Graf Belling was sold his first owner. Otto Göller, of the von Thüringen kennel, to Heinrich Müller of the von Deutz kennels. He was sold again to certain Mr. Herman Greishaber, who lived near Berlin. So the stud activites of Graf Belling were widely spread. However, Graf Belling was very potent and powerfull heredity sire, his litter brother, Greif, was by far the most influental one of Tischler's five-star litter. He was also the sire of the important Prinz v. Ilm-Athen.